Our truck bumps from side to side, the wheels in deeply rutted tracks. Nearer our coastal camp, scrub turns to woodland and we both lurch to the left as I drop a gear and edge across a scary slab of sloping stone. Back on sand it’s our final descent, to a wild coast of dazzling white dunes and granite outcrops; down through patches of Yate and Paperbark to reach our secret grove, the tent and truck tucked in clumps of Banksia. Giant Cycads are prehistoric plants, remnants of 200 million years past, the first seed-bearing plants on earth. We’re in the wilds of Cape Arid; a vast 280,000Ha National Park on the southeast coast of Western Australia. My girlfriend passes the water bottle, and we stare up at the foreboding mass of Mt Arid, the late afternoon sun catching the bouldered spine of that ancient ridge. We’ve seen no one for two days now. There are few signs, no power – and true to name – no drinking water. The next day I trudge 2km uphill from camp to the old homestead site `Hill Springs’; the 4WD track hand hewn with shovel, pick and crowbar. I’m told the grave may be somewhere here, and find it 200m to the east. I swipe biting March flies from my hands, flicking one to the ground and stomping the voracious beast with the heel of my dust-laden boot. Something makes me turn. I’m being watched it seems – and I freeze – my agitated movement attracting a curious visitor at the edge of the scrub. The emu is 5m away, 2m tall, silent and watching; neck stretched upward, head turned slightly side on. I feel no sense of danger. The eye is round, of the deepest brown, set in a wizened face of charcoal. The beak is grey and crooked, bent downwards. The front of the neck and side of the head are bare and pale. The animal is panting in the heat, the throat painted with a hint of blue. The feathers on its head are a straggly mess, black, windswept and wild; at the top of the beak, tiny upswept tufts. It’s suddenly gone. My gaze drops to the grave. I’m told the old man was a farmer from Balladonia – 200km to the north – selling up and leaving when his only brother died. He travelled alone, by horse and dray, settling in a deep valley east of here. He never married, grew vegetables and hay; ran cattle and sheep. I breathe in the hot air that rises from the ground. The dust sticks to my face, the silence somehow heavy. Even the flies have fled the heat. Dragging my eyes from the headstone, I peer back over my shoulder, turn and leave the grave for Hill Springs across the way. He would sometimes drop by for breakfast, hiking the 5km across country from his place, proudly declaring to his son-in-law that a sunrise had never found him in bed. Crossing the track I find what’s left of the homestead and peer down the valley to the sea. I imagine the grass green, the old man’s daughter and son-in-law having followed him to these parts and built this homestead; their little piece of heaven. There was once a post and wire fence, off to the left, bisecting a stand of leaning Cycads; the fence leading to a central iron gate to keep a rooster and foraging brown hens. There was a lean-to kitchen of stone, a smaller hearth and steel flue; the homestead proper being a simple rectangular gable of timber and galvanized iron. Black pigs browsed at the base of the living room hearth; a large sow and seven piglets. There were cows and ducks, fruit trees and vegetables in patchwork tilled paddocks of red loam. Just outside the fence the fold of a valley led gently down to the ocean. But all I see is a valley parched and brown; ending in a half-moon crescent – shining white in the summer sun – the distant coast of a turquoise Ferret Bay. On the southern horizon lay a colder blue; The Bight and the hundred islands of Recherche Archipelago. 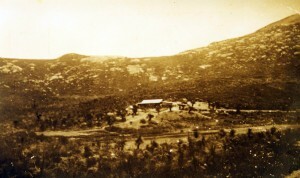 With the old man’s health ailing, he was bought here to the homestead for nursing. See a doctor? He had no time for such things. With a boat arriving at Ferret Bay, the old man was too ill to be moved and died in his daughter’s arms. Beside me are only ruins, what’s left of a kitchen and fireplace; the owners driven out by loneliness – once the old man died – everything left to burn in the horrific fires of the 1920s. 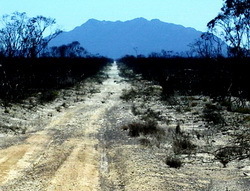 In the morning we’re heading north to Mt Ragged, then on to Balladonia; the track here dead straight and corrugated, changing from soft sand and potholes to limestone outcrops. A flock of seven emu appears from nowhere and glides alongside before suddenly darting away and back into the surrounding stands of Mallee. The air conditioning’s on full, air vents shut tight, but the dust gets everywhere. It’s still over 100km to Balladonia when I peer in the rear-view mirror, a billowing dust cloud trailing far behind; like the terrible fires that swept through these parts but could never quite erase `the splendid memory’ of one hardy old man. Ian, what a splendid essay on “the splendid memory” of this “hardly old man” and the land he loved. Quite a journey to arrive there, “a wild coast of dazzling white dunes and granite outcrops” how stunning! There is a natural beauty that stirs the soul in a place so ancient and desolate. I am struck by the words on the old man’s headstone: “To Strive To achieve To leave a splendid memory.” Ah, yes, he certainly did, and all these decades later, here you are visiting his land and his grave, and introducing readers to his remarkable fortitude and the strength of his spirit. What a place that land once was and a wonderful spot to build a “little piece of heaven.” That the old man died in his daughter’s arms was so touching and beautiful, especially that he was able to return to his homestead and see it again before he closed his eyes for his eternal sleep. Sad the way it was left to burn in the awful fires in the 1920s, but as you wrote in your last line, “the splendid memory” could never really be erased. It is indeed such a beautifully desolate place; the silence tangible. Very kind Janene; I catch your meaning. Still trying to decide whether my jottings are of the `glass half full’ or the `glass half empty’ ilk. Having just returned from a perhaps similar trip, looking for long-ago people and faraway places, your story resonated with me. Sounds like we may seek out similar places…not exactly on the beaten track. Another splendid piece, Ian, full of rich detail. I love how you capture the particularity of the place with your precise naming and description of the landscape and all its unusual features. More than once you had me running to the dictionary to look up a word. Always I sense this theme in your writing as you take me, your reader, to all these harsh, desolate places: that, in spite of Time’s inexorable forward march, somewhere in the stone and dust and ash remains a trace, a footprint, a living presence of the past. High praise indeed NP; so encouraging! Just out of curiosity, what led you to going to visit the grave & old homestead site? I honestly can’t imagine living somewhere that far out into the wild. You’d have to be a hardy sort indeed. I guess it was the rumors of that desolate beauty that took me there @ first. I originally knew nothing of the old homestead or the grave. You really captured the loneliness and isolation of this place through your vivid descriptions. I love the contrast of the dry, dusty oppression with the fanciful and curious emu, and the little family of pigs, rooting around the old hearth. Such rich life amidst that loneliness. I find it amazing that the old man from Balladonia even thought to settle here, especially given Mt. Arid’s lack of drinking water. He sounds like he was quite a rugged individual; a real character. I do find myself attracted to those wild isolated places Kris; something Australia does so well. & the emu is such an odd & curious bird. The early Europeans were indeed a tough breed. I love how your opening lines prepare the reader for the barren, desolate landscape. Once there, time stands still, or rather time stands folded in layers of past and present and stands still before his eyes. Short, frugal, sentences paint the arid wilderness, with a telling smattering of flora and fauna. By the time he has turned his back, images of a fire that could neither erase the past nor the present of one hardy old man, are dancing in the rear view mirror. Quintessential Ian! I appreciate your comments re: my efforts to describe the power of that special place.